He’s not a terrier, but the mild-mannered “TT” is a loving family dog who was bred to traipse around snowy mountains with nomadic herdsmen. He stands out for his profuse and protective double coat, a fall of hair over the eyes, a well-feathered tail and large, round, flat feet designed for sure-footedness in snowy terrain. Bred in Tibet as a companion dog, the Tibetan Terrier was also raised as a herding dog. Kept by monks, the breed was never sold or traded due to the belief that the dogs brought good luck. 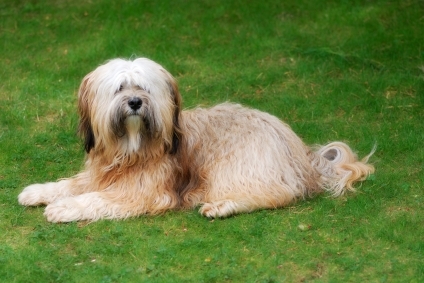 Despite its name, the Tibetan Terrier lacks true Terrier characteristics. Not likely to dig or hunt, this is one loving and kind-spirited dog. It's not unusual for Tibetan Terriers to be reserved with strangers, but they shower affection on their people. They can adapt to life in many different types of households and are a good choice for families with older children who understand how to treat dogs. With their protective double coat and large, flat, round feet to provide traction — in much the same way as snowshoes — they're well suited to homes in snowy climates. Tibetan Terriers are wonderful family dogs but are best suited for homes with school-age children who know how to treat a dog properly. Tibetan Terriers generally do well with dogs and other pets, especially if they have been raised with them. 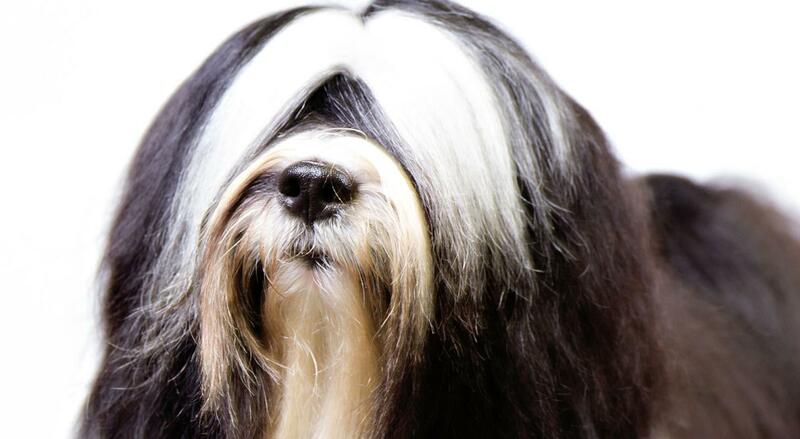 The Tibetan Terrier requires frequent brushing and a bath at least once per month. 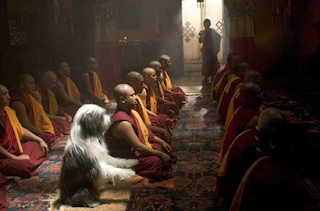 Tibetan Terriers make great watchdogs and will bark when they see or hear anything unusual. If they get daily exercise, Tibetan Terriers can do well in apartments or condos. Tibetan Terriers thrive on human companionship and do best in homes where they get plenty of attention and aren't left alone for long periods. Barking is a favorite pastime for a Tibetan Terrier. He'll bark when people come to the door, when he sees or hears something unusual, or just out of boredom. 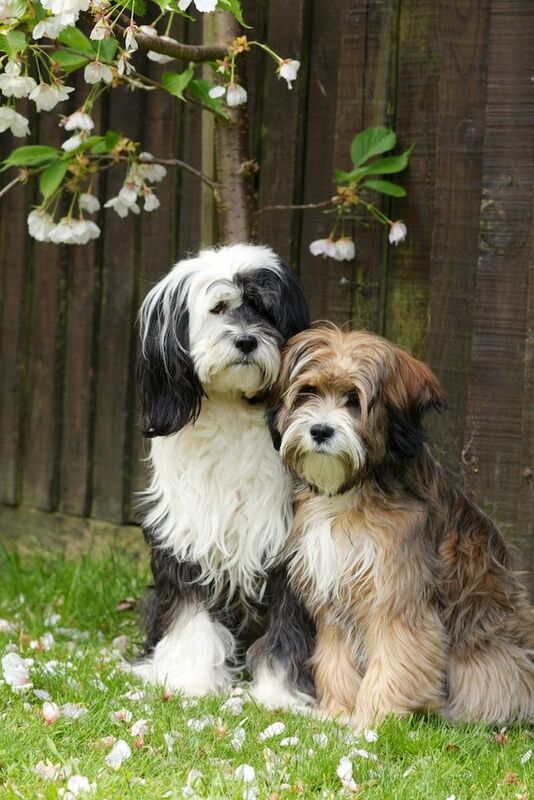 Tibetan Terriers require daily exercise and will enjoy a couple of 15-minute walks or one longer walk. The Tibetan Terrier can be easy to train with positive reinforcement techniques such as praise, play, and food rewards. Tibet’s extreme climate and harsh terrain played a role in creating a dog with a protective double coat, compact size, unique foot construction and great agility. A fall of hair covers the TT’s dark, expressive eyes, but he can see through it perfectly well thanks to his long eyelashes. The Tibetan Terrier has large, round, flat feet that act like snowshoes and give the dog traction in snowy conditions. The TT’s long, luxurious coat parts down the middle and can be any color or combination of colors. Colors and patterns include white, gold, tricolor, brindle, silver, black, and parti-color (a color plus white). The Tibetan Terrier is not a true terrier but was given that appellation because of its size. With its mountainous terrain, Tibet is sometimes referred to as the Roof of the World. It was in that harsh, high, remote land that the Tibetan Terrier was created. Prized as companions, the dogs were raised by Buddhist monks, known as lamas, from whom they took their name Holy Dog. But the shaggy, medium-size dogs weren't limited to life in the lamaseries where they were born. Considered to be luck bringers, they traveled the high plateaus with nomadic herdsmen, guarding their tents. Fearful of tempting fate by "selling" their luck, neither the lamas nor the herdsmen ever sold the dogs. Instead, they were given as gifts in return for favors or services or presented to officials as a mark of esteem. The Tibetan Terrier might have remained an obscure breed if not for a grateful Tibetan man who gave a Tibetan Terrier to Dr. Agnes R. H. Greig, who had saved his wife's life. Dr. Greig named her new puppy Bunti and became a fan of the breed. Eventually, she acquired a male, also as a gift, and began a breeding program, establishing the Lamleh line of Tibetan Terriers. 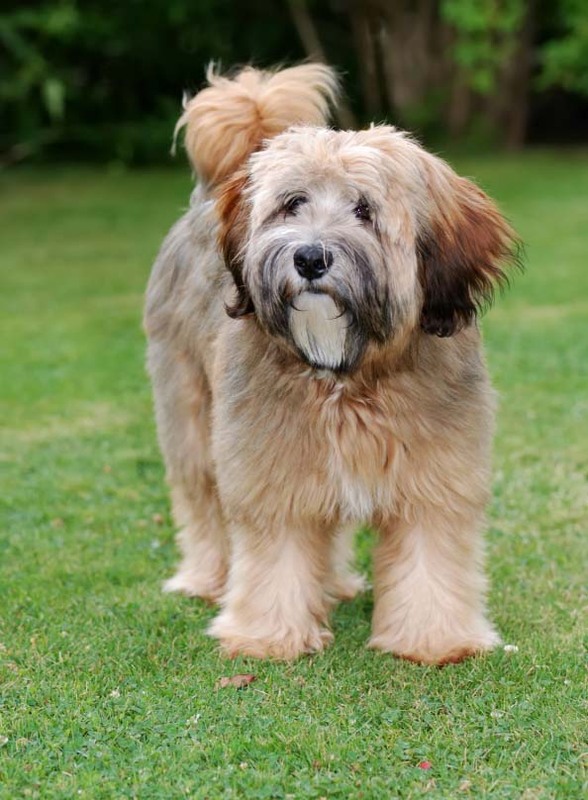 Being neither a sporting dog nor a mix, the breed was given the name Tibetan Terrier, despite the fact that it wasn't a true terrier in either instinct or temperament but merely resembled one in size. 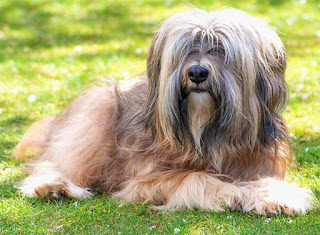 A breed standard was created by the Kennel Club of India in 1930, and the Tibetan Terrier was officially recognized by England's Kennel Club in 1937. The first Tibetan Terrier imported into the United States, Gremlin Cortina, arrived in 1956. Owned by Dr. Henry S. and Alice Murphy, she was so beloved by them that she inspired Alice Murphy to establish her own kennel, Lamleh of Kalai. The Tibetan Terrier Club of America was formed in 1957, and the American Kennel Club recognized the breed in 1973. 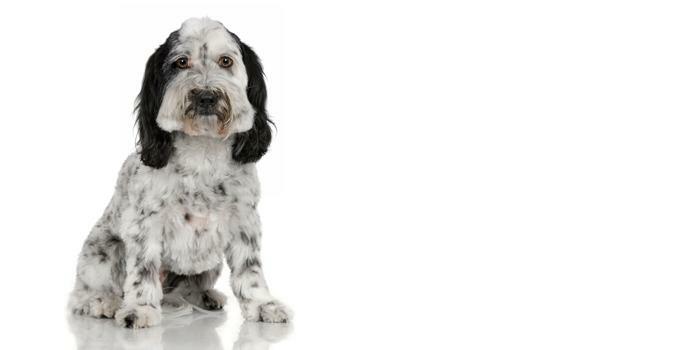 Today the Tibetan Terrier ranks 95th among the 155 breeds and varieties recognized by the AKC. The Tibetan Terrier is smart, pleasant, and affectionate. Gentle but fun loving, he's dedicated to his family but may be cautious or reserved toward strangers. Puppies are active and lively — what puppy isn't? — but settle down as they reach maturity. True to their heritage, they make wonderful watchdogs and will bark an alert if they see or hear anything suspicious. They don't like to be left alone for long periods, preferring the company of the people they love. Tibetan Terriers are known for adaptability and a sense of humor. Like every dog, Tibetan Terriers need early socialization — exposure to many different people, sights, sounds, and experiences — when they're young. Socialization helps ensure that your Tibetan Terrier puppy grows up to be a well-rounded dog. 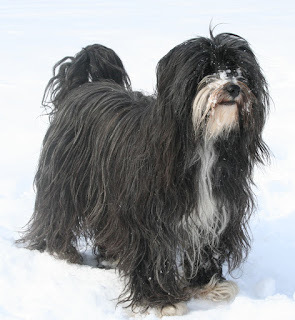 The Tibetan Terrier, which has an average lifespan of 12 to 15 years, is prone to major health concerns such as progressive retinal atrophy (PRA) and lens luxation, as well as minor problems like patellar luxation, ceroid lipofuscinosis, cataract, canine hip dysplasia (CHD), and hypothyroidism. Often distichiasis is noticed in this breed; eye, hip, and thyroid tests are suggested for dogs of this breed. Tibetan Terriers are adaptable dogs at home in a variety of households, from condos to castles. They should live indoors with their people, not stuck out in a backyard or kennel. Once they've matured, they are just as happy being couch potatoes as they are active family dogs. Like any dog, an adult Tibetan Terrier requires daily exercise to stay healthy and happy, but he'll be satisfied with a couple of 15-minute walks daily or one longer walk. Naturally, puppy and adolescent Tibetan Terriers are filled with energy and excitement and require higher levels of stimulation and exercise. Although it's nice for a Tibetan Terrier to have a securely fenced yard where he can play, it's not a great idea to leave him out there for long periods. A bored Tibetan Terrier is a barker, and a really bored Tibetan Terrier is an escape artist who's perfectly capable of climbing, jumping, or digging his way over or under a fence. 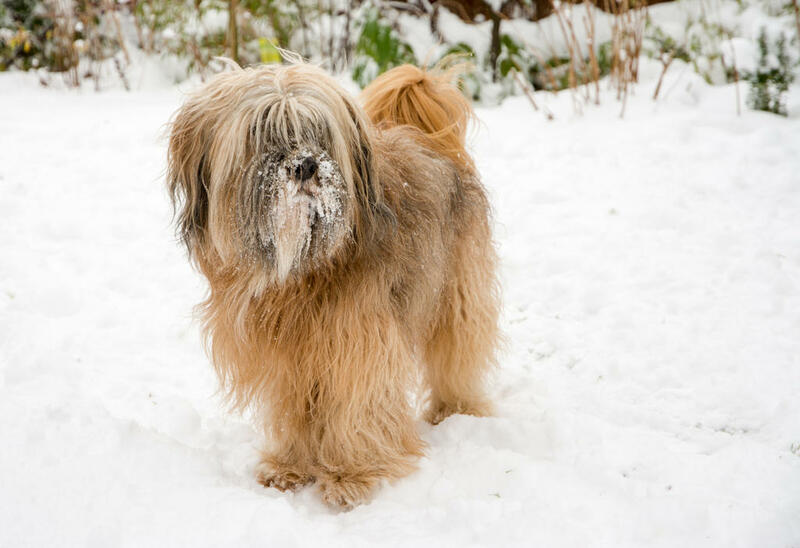 Housetraining can take time, but you'll be successful if you're patient and give your Tibetan Terrier a regular schedule and plenty of opportunities to potty outdoors, praising him when he does so. Crate training is strongly recommended. It will make housetraining easier and keep your Tibetan Terrier from chewing things while you are away. The crate is a tool, not a jail, however, so don't keep your Tibetan Terrier locked up in it for long periods. The best place for a Tibetan Terrier is with you. TTs are generally amiable, but sometimes they have their own agenda. Keep training fun, be consistent, and use positive reinforcement techniques such as praise, play, and food rewards. Because it is intelligent, Tibetan Terriers are an ideal breed for training. But make sure you know what you’re doing, as the dog may use its smarts to get the upper hand and train you instead! There are a few things in mind when training a Tibetan Terrier. Never use negative methods of training, as Tibetan Terriers will ignore you or rebel against the negative methods of training without modifying its behavior. You should use positive methods of training, such as treats, affection and play in order to teach obedience. For training to be successful, you’ll also have to be completely consistent throughout the process. Make sure that your Tibetan Terrier knows what it has to do in order to be rewarded, and don’t let your dog sucker you into giving it a reward without doing the work. When you keep your behavior consistent and give your dog achievable objectives every day, your Tibetan Terrier will master the finer points of training. While walking your Tibetan Terrier, make sure it is always on a leash. Thanks to this dog’s mischievous streak, it may try to escape and explore the great outdoors. And if you chase after it, it’s all a big game to the Tibetan Terrier. 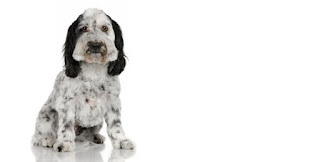 The long coat of the Tibetan Terrier needs to be brushed daily to keep it tangle and mat free. The coat should always be misted with water before brushed, otherwise the hair will break off. It is important to brush the coat all the way down to the skin to ensure all loose hair is removed. Mats are espcially prone to form behind the ears, on the chest, the belly and the armpits. For dogs who won't be shown, owners can opt to clip the hair into a puppy cut, which requires much less maintenance. Tibetan Terriers should be bathed monthly. Tibetan Terriers love kids and can match their energy levels all day long, but they're a little rambunctious for households with children under the age of 6 years. Tibetan Terriers usually get along well with other dogs and cats, especially if they're introduced to them in puppyhood. Tibetan Terriers are wonderful with school-aged children and other animals if raised with them. Doing OK with apartment living if properly exercised, this breed is inactive indoors but enjoys a good romp outside. Enjoying his own space in the yard, he can also be satisfied with daily walks and gentle praise. In need of companionship, he may act out if he doesn't get enough attention. If not given proper leadership, the Tibetan Terrier is likely to think of himself as the alpha and may become an over-active barker. Only shedding once a year, he makes a good fit for the allergy sufferer but will need grooming every 2 to 3 days. The Tibetan Terrier was nicknamed Luck Bringer and Holy Dog in his homeland of Tibet. The Tibetan Terrier will be happiest starting his day in the bed of his owner. After snuggling, he'll follow his owner wherever he may go. Ready for his daily walk, you'll find this breed waiting patiently at the door. Going back inside and enjoying a nice meal, the Tibetan Terrier will likely relax the rest of his day away on the couch. Happy with a couple of play sessions and a few petting sessions in the afternoon, the Tibetan Terrier will end his day just as he began it, cuddling close to his owner.